My second pair. I’m a boot killer. I farm and work every aspect of property maintenance. Also am an avid motorcyclist, (all sorts) and outdoorsman. My first pair has lasted me over a year (unheard of). They are still fully functional though look like hell. No break in pains, no insoles, put to work right out the box. The best. 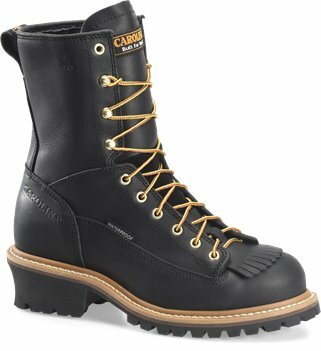 These boots fit and wear better than the other brand name that I used to have.the water resistant membrane actually works as good as my water proof muckers do. Started falling apart in 9 months with normal wear. I take care of my boots and never abuse them, they cost to much to replace if I do. I was shocked to see them coming apart, never had a problem with Carolina boot up until now. I've been wearing black logger boots seance 1980 in the oil field. there the only boot I wear. Boot felt great out of the box, minimal break in time would buy again. Wonderful service! I had them shipped over night and my order was processed and at my door within 48hours. They fit true to size and are very comfortable! Would recommend to anyone! First of the boots feel great on my feet, and the looks were better than the picture i seen on online. Im glad i made this chioce to buy the boots. Really a bargain at this price. I was expecting to pay $250 for a pair of climbing boots. Tried them with some Dr. Sholls Socks and the fit was perfect. 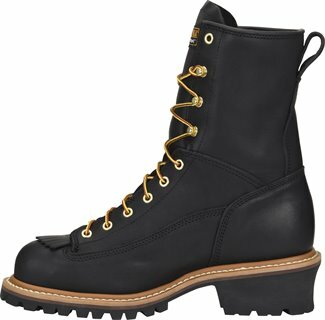 Waiting for some FALL weather so I can try these boots on a Rohn Tower. Boots fit better than a pair of $400 boots that i had before.